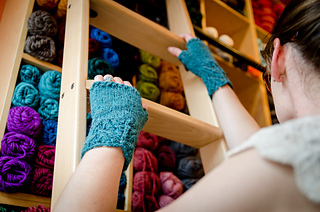 These mitts were designed as part of a collaboration between Chicken Boots, Knitted Wit and Sweet Shop Patterns in honor of the Interweave Unofficial Harry Potter Knits magazine issue. 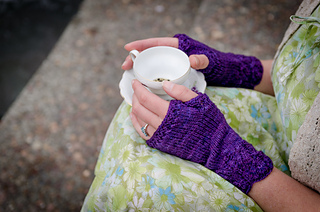 When I told my 9-year old that I wanted to design something that Professor Trelawney might wear, she said, “Tea leaves! 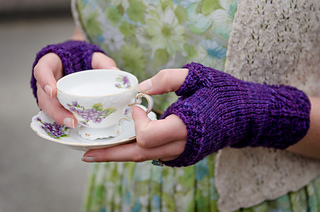 Because Trelawney reads them.” I was instantly inspired to make these fingerless gloves with a leafy lace cuff. You’ll need just one skein of Knitted Wit Welterweight Rambouillet. We also did a version using Rowan Felted Tweed DK that worked out beautifully. You’ll need just one skein of the Felted Tweed.